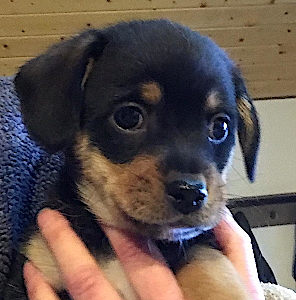 Puppies younger than 16 weeks cannot be placed in apartment complexes as they cannot go out in communal areas until about 10 days after their last vaccine at 16 weeks. Hey everyone! Big girl Karleigh here! 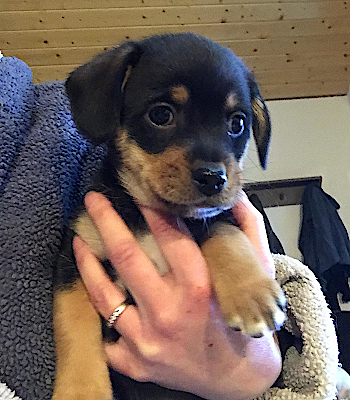 I am a 9-week-old (as of 03/19/19) female Terrier mix puppy, and I already weigh a whole 5 pounds! That may not sound like a lot to you, but here in my SBRET foster home, that's a big girl! My mom weighs about 20 lbs, and I will probably end up in that range too. I am a little bit on the quiet and shy side and it takes me a minute to warm up to strangers, but when I do I turn into the sweetest little kiss-your-whole-face snuggler you have ever seen! I love running and playing in my fenced backyard with my brothers and sister. My foster mom says I am such an easy puppy. I don't know what that means but I think it's good. I eat all my food, and I sleep quietly all night in my expen with my brothers and sister, but I'm happiest when I find a warm, comfy lap to sleep in. If you have a forever home for a sweet, shy little girl, I would love to meet you! I will need someone with some daytime flexibility to help me with my house training and an adult home or one with children over five years old. I will be spayed and microchipped, and will have my next vaccine soon. My adoption fee is $175.